Why is Latin America Moving to the Cloud? I’ve been working with entrepreneurs over the last five years and I always hear about several barriers that keep a solid entrepreneurial ecosystem from evolving. By entrepreneurial ecosystem I mean the tools, partnerships, and other factors that play a role in the success of a start-up business. One of the major barriers that limits the development of these entrepreneurs, especially those who are from emerging markets, is how to make technology work for them and not the other way around. Read the analysis: How Alibaba expand their ecommerce ecosystem globally. Why is this happening? Although new generation of connected consumers in markets around the world is allowing many businesses to sell and grow via e-commerce, entrepreneurs are moving to the cloud not to meet consumers online but rather to make their business more efficient and save money on operational costs. Besides efficiency and operational savings, some organizations turn to the cloud because it holds the potential to truly revolutionize their business processes and enable them to leapfrog multiple technology steps in their digital transformation. According to the International Data Corporation (IDC), the world will reach $122.5 billion in 2017 with all kinds of cloud services, and it represents an increase of 24.4% since 2016. By 2020, IDC forecasts public cloud spending will reach $203.4 billion worldwide. What about in emerging markets such as Latin America, aren’t those solutions too expensive for them? Actually they aren’t, Latin American companies are making major investments in the cloud to strategically grow their business over the next decades. 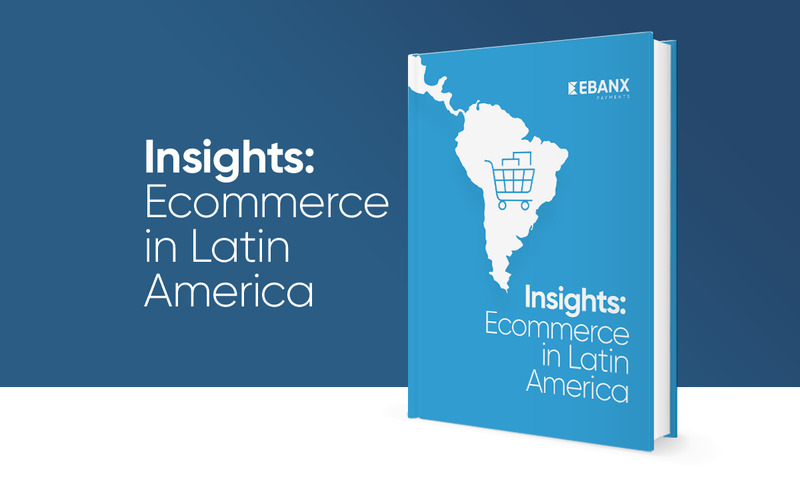 The IDC reported Latin America will experience the fastest spending growth over the forecast period with CAGRs 27% with the United States seeing the slowest growth rate of 19%. Cloud services have been one of the most important tools for Latin American entrepreneurs. Moreover, the cloud is becoming even more relevant in emerging markets because they offer an unique edge to local businesses. They are cheaper, they are helping structure their business processes, and last but not least, they are helping them advance technologically. 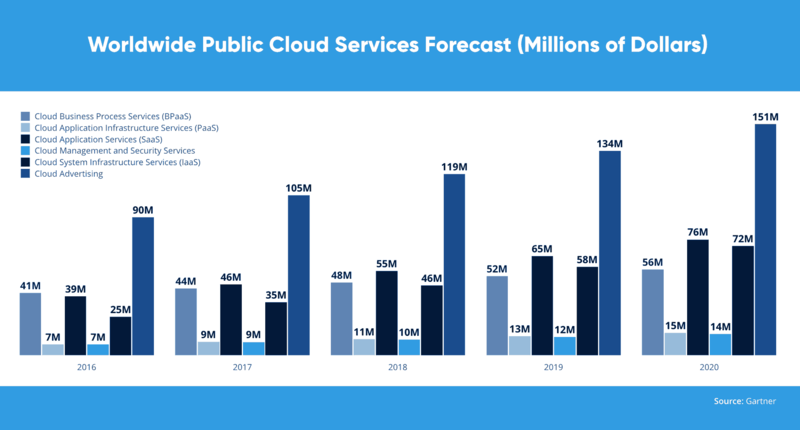 Worldwide Public Cloud Services Forecast (Millions of Dollars). Original source. (View the large image). Countries like Brazil, Mexico and Chile are ahead of cloud market growth in the world not only because of their highly connected end consumers, but also because companies look for competitive advantages and ways to ensure the most efficient cost-management and data processing. For example, according to an IDG Report, about 62% of companies believe that their IT budget for cloud services will increase in 2018, with more than half of them allocating at least 45% of their IT budget in SaaS (Software-as-a-Service), 30% in IaaS (Infrastructure-as-a-Service), 19% in PaaS (Platform-as-a-Service), and 6% in other service models such as Backup-as-a-Service and Storage-as-a-Service. But, what’s the most known advantages that are making them invest so much on this? Obviously, there are several reasons, but I will list the top five. Get the most relevant info on Latin American Market. Latin American companies usually have to purchase several imported equipments and construct a data center before operating, but with the cloud they don’t have to spend significant money on hardware, facilities, utilities and other aspects of these operations. Therefore, Latin Americans are not investing their profits with traditional computing and waiting before it gets any value from its investment in the data center. Most cloud providers are extremely reliable in providing their services, with many maintaining 99.99% uptime. The connection is always on and as long as workers have an Internet connection, they can get to the applications they need from practically anywhere. Some applications even work offline. Consequently, data and applications are available to employees no matter where they are in the world. Workers can take their work anywhere via smart phones and tablets, visiting customers in their homes or offices, or working in the field or at an office. The trend of staying online and connected all the time is also growing in Latin America. According to a GSMA Report published on Mobile World Congress of 2016, Capital Expenditures by mobile operators in Latin America are increasing significantly, with a cumulative total of USD 193 billion expected over the seven-year period 2014-2020, and consequently Internet access in Latin America is also increasing. With SaaS, the latest versions of applications needed to run the business are made available to all customers as soon as they’re released. Immediate upgrades put new features and functionality into workers’ hands to make them more productive. In contrast to homegrown or imported software that is more expensive for Latin Americans (because of various import taxes) and only has major updates about once a year, SaaS updates are released quite frequently. Cloud applications improve collaboration by allowing dispersed groups of people to meet virtually and easily share information in real time and via shared storage. This capability can reduce time-to-market delays, and improve product development and customer service. For this reason, it helps Latin American companies to form remote work groups, without the need to bear the high costs of commuting and, it encourages the development of multicultural groups, with different perspectives, that add value workplace teams. With fewer data centers worldwide and more efficient operations, we are collectively having less of an impact on the environment. Companies who use shared resources improve their ‘green’ credentials and, in Brazil, for example, it represents reduction on income taxes and since United Nations Climate Change Conference (Cop21) it turns into one of the most strategic public policy development fronts for UN member countries, such as Brazil, Mexico, Chile, Colombia, and Peru. Over time, a network capable of connecting all the computers in the world became reality. However, it wasn’t until recently that it became efficient and fast enough to replace physical equipment and infrastructure, and was able to give entrepreneurs in emerging countries a broader outlook for their business with tech as their partner. Clearly there are a lot of challenges entrepreneur ecosystems in emerging markets will encounter as they introduce more tech, but by incorporating cloud computing into their business environment they will be able to stay ahead of efficiency and modernity. Moreover, the elasticity and variety of cloud services allows Latin American business, regardless of size, scope, or goals, to take advantage of tech and use it as a tool to build bridges around the globe, all the while, supporting a solid chain of performance and success.